Karma is a b%^ch y’all. 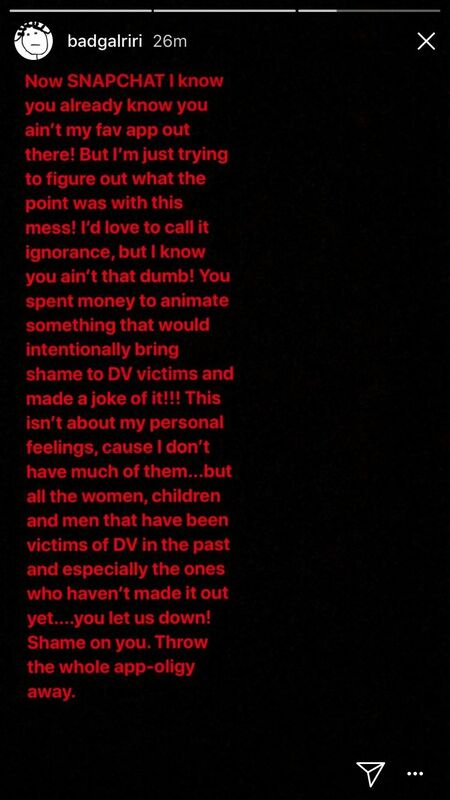 Just ask Snapchat, who learned the hard way that boasting ads making light of domestic violence, isn’t good for business…especially when it concerns Rihanna. Yeah, they tried it. But don’t you worry, Rihanna finished it. “Now SNAPCHAT I know you already know you ain’t my fav app out there,” the singer wrote in an Instagram story posted Thursday morning. Snapchat yanked the ad earlier this week and apologized for their lapse in judgment. We just wanted you to know that we don’t like Snapchat anyway. We’re waiting on FentyChat. Thank you. BEAUTIES: Are you following Rihanna’s lead and deleting Snapchat from your phone?